What happened with the PWC report on Central Bank? We in Curacao have a tendency to forget about important matters and let life go by itself! Since mid 2013 the Minister of Finance, Dr. Jose Jardim, told the press that by October 2013, the audit, ordered by the Government of Curacao and conducted by Price Waterhouse Cooper (PWC) Dutch branch, would conclude and the conclusion report would be published! 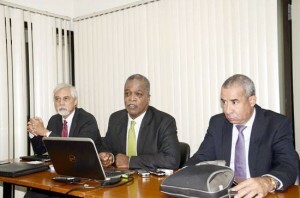 Since then there have been numerous rumors related to this investigation and according to well informed sources, the President of the Central Bank of Curacao and St. Maarten (CBCS), Dr. Emsley Trimp, was NOT happy with the preliminary report as presented by PWC! According to the same source, Mr. Tromp wanted some conclusions, as mentioned in the preliminary report changed, but this was rejected by PWC investigators. Apparently Tromp was claiming that the PWC investigators gave too much importance to the declarations by former Minister of Finance George Jamaloodin, and former Prime Minister Gerrit Schotte. It's a known fact that CBCS is being ruled with strong hands by Emsley Tromp and nobody, not even the government and parliament, can interfere in matters concerning our Central Bank. Prior intentions by Parliament to have the General Accountability Chamber (Algenene Rekenkamer) (ARK) investigate and bring to light dubious matters concerning the management by Tromp in CBCS failed! Tromp refused to give any cooperation to the ARK and based the reason of his refusal on "Bank secrecy". For the longest while opponents have been denouncing corruptive management by Tromp in our Central Bank! These allegations took more force after Tromp approved the purchase of Banko di Caribe and Ennia Caribe by a notorious Irani businessman Ansary. With these acquisitions Ansary immediately took control of a big chunk of our financial sector. Than came the case of Tromps' very good friend, John Deuss, who was convicted of money laundering using his bank in Curacao. Tromp arranged the permit for Deuss to operate a bank in Curacao, notwithstanding Deuss' bad reputation and criminal track record. These two events put the final touch on Tromp's reputation! He was accused to use CBCS money to buy political support and was allegedly involved in a scam involving an obvious pay off by Banko di Caribe (Ansary), worth 3 million guilders. 800 hundred thousand of this money resulted on Tromp's personal pension fund. Also he was accused of illegally using CBCS funds to arrange a "loan" (bonds) to the order of Curacao Utilities Holding, on behalf of Aqualectra NV! After 10.10.10, the Central Bank became a joint bank between Curacao and St. Maarten. Things started on a wrong foot ever since because of the deadlock created by the constellation of the Supervisory board, consisting of equal representatives of Curacao and St. Maarten. Both new countries appointed 3 members and then they will appoint the President of the Board, which never took place! Meanwhile Tromp used CBCS funds to buy support from the St. Maarten members by approving a loan for the St. Maarten Harbor Company! Again Tromp’s opponents claimed that this venture was not legal since there was no compliance with statutory rules, which dictates how the Bank reserves should be invested. All by all it was and still is a total mess in the CBCS’ management! And there was nothing the government neither our parliament could do against the allegation of mismanagement and improper use of the bank funds. However, Emsley Tomp refused to step down or accept any responsibility for all the accusations! Finally it was decided that an independent Accountant Office will audit CBCS and investigate the alleged mismanagement by Tromp. However once again Emsley Tromp refused to step aside in order to not disturb or influence the audit done by Price Waterhouse Cooper. This audit should have finished last October 2013. We are now in April 2014 and still there's no word on the final report done by PWC! Fact of the matter is that the current Minister Finance, Dr. Jose Jardim, is one of Tromp's very good friends. Everybody knows that there's a good job with a big salary waiting on Jardim at CBCS! Courtesy of Dr. Emsley Tromp. You wonder for how long Dr. Jose Jardim will refrain from giving substantive information about the audit done by PricewaterhouseCoopers (PwC) on the Central Bank of Curaçao and Sint Maarten? By Jorge Sulbaran. Jorge is an opinion columnist for Curacao Chronicle.